Other than food blogging my life away, February has been pretty good to me. This last month Jared made me the most darling valentines dinner for a nice switch-ero. I was so incredibly proud of him. My steak was perfectly cooked and I’m starting to seriously think he youtube studied and everything. About halfway through cooking all of the sudden I hear a huge “OH F*$%” come from the kitchen. I was like crap… I know this is bad. I ran in and he had the most horrific 2nd degree oil splatter burn on his middle fingers. So unfortunately after my steak I had to go raid CVS for some midnight burn aid but all was well and he is healed now. I also got to spend a mini weekend getaway with my family in California. I really needed that little trip. Next week you guys can follow me as I hop across the pond! I’m going to England for spring break and I am STOKED. 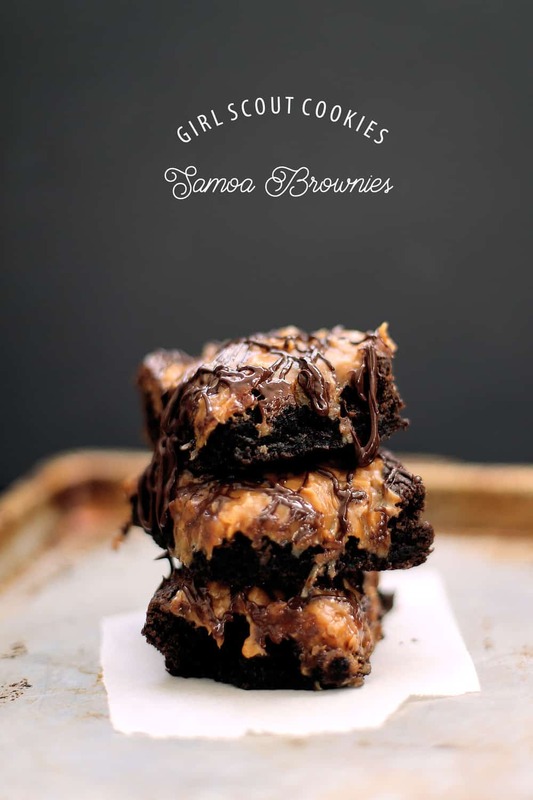 I am also rambling so I’ll let you go, enjoy your samoa brownies. Save me one K? 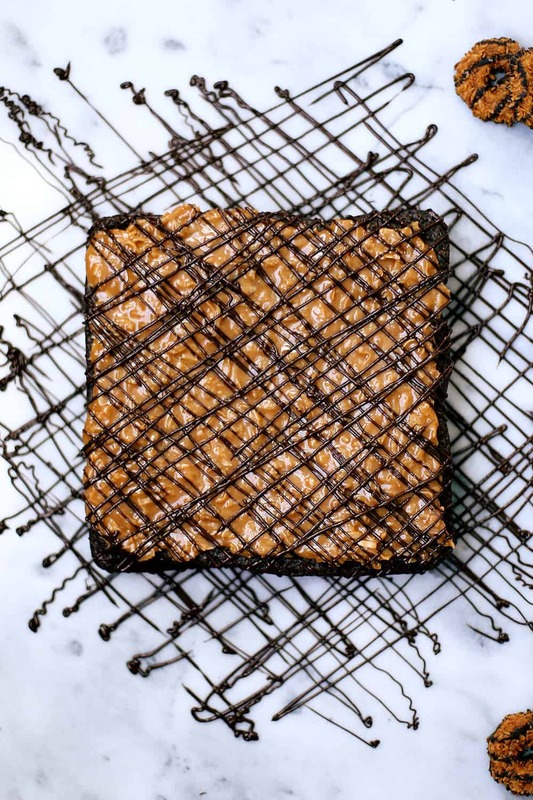 Preheat oven to 325 degrees and line a 8×8 or 9×9 nonstick pan with parchment paper. In a medium bowl combine flour, cocoa powder, cayenne pepper, salt and baking powder and set aside. In a large bowl whisk eggs, canola oil, sugars and vanilla extract. Add in dry ingredients in two segments until just combined. Pour in pan and bake for 30-35 minutes until a toothpick comes out clean. 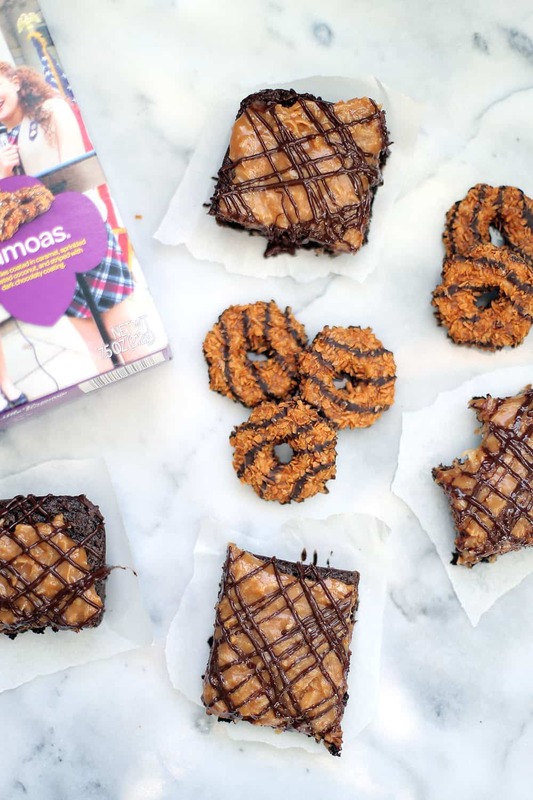 Let cool for 1 hour before adding samoa topping. In a heavy bottom sauce pan melt caramel candies and heavy whipping cream stirring constantly to prevent the caramel from scorching. Remove from heat and add in coconut. Melt chocolate chips in a glass bowl in 30 second increments make sure to stir after each period. Should take only about a minute. 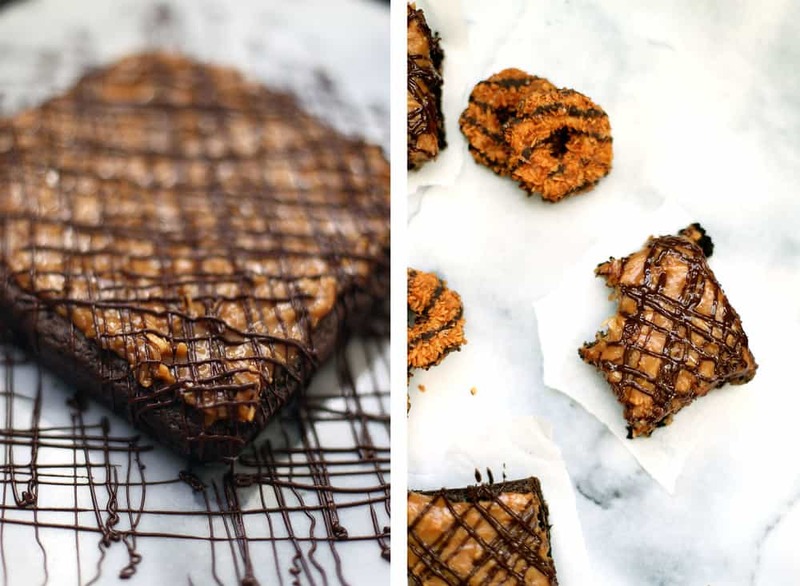 Transfer melted chocolate into a piping bag or ziplock bag and cut a very tiny tip to pipe chocolate on brownie. *Note* You can use store bought caramel or your own recipe, I just happened to have a crap ton of caramel candies and it was simple!